With its clamshell design and VGA camera, the quad-band EDGE W300 isn't quite as gosh-wow as the K790 and W810, but it's still a Walkman phone with a Memory Stick Micro slot and support for USB Mass Storage, making it easy to get MP3 or AAC music onto it. 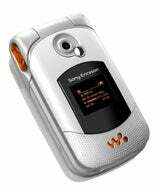 But the most interesting feature is in the add-ons: the Sony Ericsson reps showed off the MPS-60 portable speakers -- small enough that I could carry them both in one hand, but with surprisingly rich sound. Instant party! Dan's Thoughts: USB Mass Storage support sounds pretty fly. I wish more phones would integrate that, let you drop music or pictures on there just like a flash drive. Or providers should uncripple Bluetooth's OBEX profile. That would be nice too. Verizon, I'm looking at you.